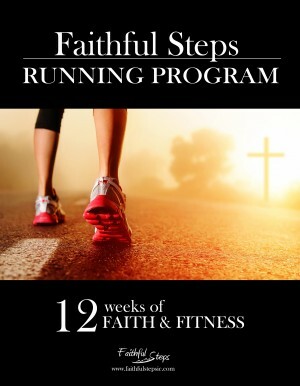 The Faithful Steps Running Program is a 12 week Bible study and training program with a focused goal of building your Faith and Fitness. The study book is filled with encouraging devotions that illustrate the parallels between an endurance sport and the endurance that Christian faith requires. The tone is conversational and accessible, and the workout plans, discussion questions, weekly challenges, and Bible verses make it both a practical resource and workbook for individuals and groups. From advice about shoes, strength training, and Christian music for your workouts, to tips on race etiquette, this book will be useful and inspirational. Beginner- have little to no running/fitness experience. Intermediate- have some running/fitness experience and are able to run for at least 5 minutes or more without stopping. Advanced- have a well-established running foundation, can run at least 3 miles, and are ready to amp up your training with some challenging drills and distance runs. Walkers- anyone wanting to do a walking workout. Programs are for 14 years+ and children 14-16 must be accompanied by an adult. Childcare for younger children/siblings will not provided. Participation Fees: $25 includes book. However, you may also download the form here and bring it with you or register at the door. So, whether you are a beginner, intermediate or advanced runner, this program has something for you. Be ready for your first, second, or thirtieth 5K road race in just 12 weeks, and learn how this sport relates to the Christian faith in the process!